This list is based on the best match of probe bandwidth and scope/plug-in bandwidth. The P6009 is a low-input-capacitance, high-voltage passive probe with a signal attenuation of 100X. It is designed for use with wide-band, real-time oscilloscopes, and may be used with any plug-in unit or oscilloscope having a 1-megohm input resistance and an input capacitance of 15 to 47 pf. 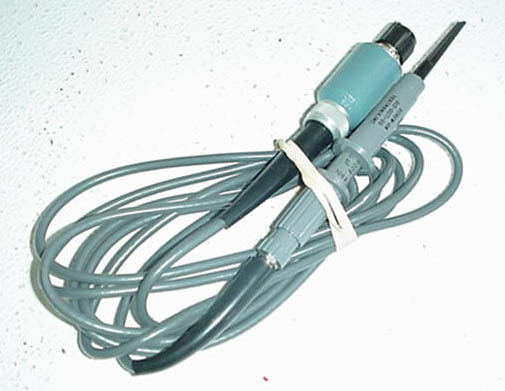 The probe is available with a standard BNC output connector or with a special BNC connector for readout oscilloscopes. The readout version is recommended for use only with a TEKTRONIX 7000-Series Mainframe (with readout) or the TEKTRONIX 485 Oscilloscope. When used with these instruments, the special connector on the probe causes the oscilloscope readout to switch, automatically correcting for attenuation of the probe. The P6009 consists of a probe-body assembly, a 9-foot cable, and a compensating box assembly with a BNC connector. The compensating box houses adjustments for optimizing the high-frequency response of the probe. Input Resistance : 10 MΩ within 2% (includes input R of amplifier). Input Capacitance : Approximately 2.5 pF. Compensation Range : 8 pF or less to at least 47 pF. Maximum Input Voltage : 1.5 kV (DC or RMS), derated with frequency. Weight : Approximately 8 oz. net. PROBE BODY : @4 inches, length; @0.8 inch, maximum outside diameter. CABLE: @9 feet between strain relief bases. COMPENSATION BOX: @2.9 inches, length; @1.2 inches. maximm outside diameter. Temperature : -15° to +75°C. Altitude : To 15,000 feet.